In preparation for 2017's ABA Days in Washington, DC , the Florida Bar Foundation teamed up with SRLN to develop powerful tools for showing policy makers the impact of LSC funding on the lives of Floridians in every part of the state. 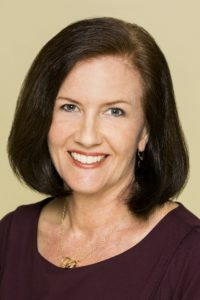 In this post, FBF Communications Director Nancy Kinnally explains why she believes the the same sort of analysis that made the ABA Day team’s visuals so powerful could be used to communicate with other key audiences, making media, legal advocacy and philanthropic efforts more effective. As The Florida Bar Foundation’s longtime communications director and a native Floridian, when I first heard about President Trump’s proposed elimination of federal funding for the Legal Services Corporation (LSC), I immediately recognized the need to communicate to Florida’s Congressional delegation in clear and convincing terms the potential consequences for our state. 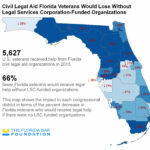 ABA Day in Washington was coming up, and I wanted to create the best possible materials for Florida’s team to make the case for civil legal aid, and in particular to advocate for LSC funding. Being familiar with the state’s civil legal aid landscape, I had a strong hunch that rural areas, where political opposition to LSC funding is traditionally strongest, were also the most heavily dependent on LSC funding. But I wasn’t sure how best to communicate it. The approach The Florida Bar Foundation chose made use of a technology not often utilized by the civil legal aid community: Geographic Information Systems (GIS). Using GIS, data can be displayed on maps to help people visualize how an issue affects a geographic area. With help from the Self-Represented Litigation Network (SRLN), that’s precisely what we did for lawmakers – with extremely positive results. The maps were so effective at communicating the need for civil legal aid, that I wanted to share what we learned. This post is one way of doing that. The other is an Oct. 10 webinar, where I’ll be presenting with Alison Davis-Holland of SRLN and Jim Kowalski of Jacksonville Area Legal Aid. In the webinar we’ll talk about our experience with the use of GIS and about other potential uses of the technology for communications, advocacy and strategic planning. But first, let’s go back to where it all started – with a theory. Based on experience, I knew that Florida’s rural areas have fewer lawyers to begin with and lack strong local legal aid societies. I also knew that their local governments tend to be less likely to fund civil legal aid. And I was well aware that due to a dramatic drop in revenue from Florida’s Interest on Trust Accounts program, funding from The Florida Bar Foundation to local legal aid organizations has been reduced by nearly 90 percent in eight years. The Florida Bar Foundation was at one time the largest funding source for civil legal aid in Florida. 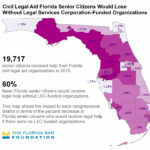 But today, the nearly $22 million in LSC funding Florida receives accounts for about 27 percent of total civil legal aid funding in Florida, far surpassing the Foundation’s share. Just before I began to contemplate all this in relation to the potential defunding of the LSC, I learned that the SRLN had a GIS expert – Alison Davis-Holland – on staff, and that she could create maps to render data in a compelling way. So, I got together with the Foundation’s Information Technology Director Chuck Hays, and the two of us began working with Alison to determine how to display – in a way that would be meaningful to lawmakers – the closed case data the Foundation collects from the 30 civil legal aid organizations in Florida that it helps fund. With a goal of educating those who were either neutral or opposed to civil legal aid funding, we decided to use zip code data to display closed case numbers by Congressional district, a task made possible by GIS. We wanted to display the data on maps, not only for all cases in general, but also by demographic and case type. What we devised was a way for each of Florida’s 27 members of Congress to see – on a customized one-page profile for his or her district – how many and what percentage of veterans, domestic violence victims, seniors and Floridians facing housing insecurity were served by LSC programs versus non-LSC programs. Each lawmaker received a meticulously quantified “picture” of the impact on constituent services in his district if the LSC were defunded. As suspected, in rural Congressional districts LSC organizations provided the vast majority of civil legal aid. In a number of districts they were responsible for close to 100 percent of the free civil legal help provided to individual representatives’ low-income constituents. The LSC organizations in those areas were essentially the only game in town. The test of the materials came April 26-27 when Florida’s ABA Day team – which included Florida Chief Justice Jorge Labarga, then-ABA President Elect Hilarie Bass, and Florida Bar Foundation leaders – visited with members of Florida’s Congressional delegation, armed with the district-specific data, as well as statewide maps that showed the relative impact among districts. Members of Florida’s ABA Day team reported that the materials proved to be accessible, hard to refute, non-partisan, concise and localized. 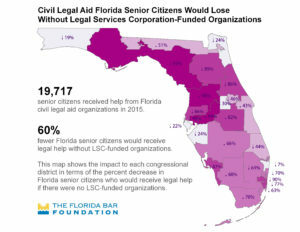 Chief Justice Labarga said the format was “easily interpreted by busy lawmakers.” The Foundation’s lobbyist, Berneice Cox, who has coordinated the visits for Florida’s ABA Day team for years, said that it “made all the difference” to be able to present the data by Congressional district. The Foundation’s executive director, who was in many of the one-on-one meetings, said the materials were “well worth the investment,” which was less than $7,000 for the GIS analysis. Among the key takeaways for us was that GIS has tremendous potential for identifying needs and service gaps, demonstrating impact, supporting collaboration, and driving strategy in grantmaking. The same sort of analysis that made the ABA Day team’s legislative advocacy more effective could be used to communicate with other key audiences, making media, legal advocacy and philanthropic efforts more effective. GIS and visual data should be considered an essential part of our communications toolkit.